It doesn't matter where you are with the shopper experience right now… we have something to help you! Many product categories require effort on the part of consumers to make an informed purchase decision. Much of this effort is conducted prior to any visit to a bricks-and-mortar store, if the consumer makes it to a store at all. "Showrooming", the process of going to a bricks-and-mortar location to handle merchandise but then checking price and purchasing online, has become increasingly popular especially among younger shoppers. There is ample evidence that over 50% of consumers with a smartphone research prices online while in store and one third of these consumers leave the store and purchase from a competitor. If you are only relying on in-store observational research to understand consumer choice behavior, your information is likely to be incomplete! Today, consumers do not follow a nice linear path that results in a purchase decision. Consumers, through standard retail channels, internet and social media, have access to near perfect information and buying options. The buying process is more complicated than in years past but it provides more touchpoints where consumers and marketers can interact. Each touchpoint provides an opportunity for you to influence consumers' purchase decisions. So how do you gain a better understanding of the shopper decision process? ShopperSmart™ is your key to a greater understanding of the consumer shopping experience. ShopperSmart™ is based on a widely accepted theory of decision behavior, Theory of Consideration Set – Elimination by Aspects by Amos Tversky, 1972. Based on this theory shoppers begin the decision process with a preconceived set of evaluation criteria where brands/products are considered as well as various product attributes. 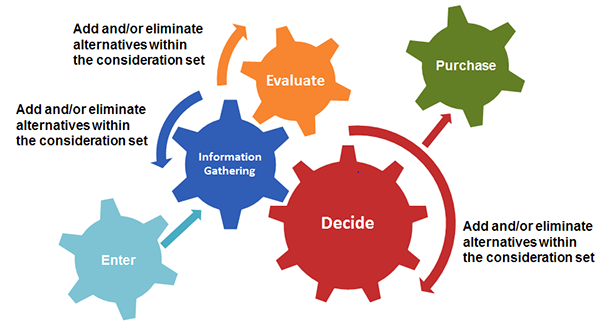 The brands and attributes often change (brands and attributes are added and dropped from the decision set) throughout the information gathering, evaluation and decision process. ShopperSmart™ will provide you with a clear understanding of the decision process at every stage and how to influence consumers for the most impact.